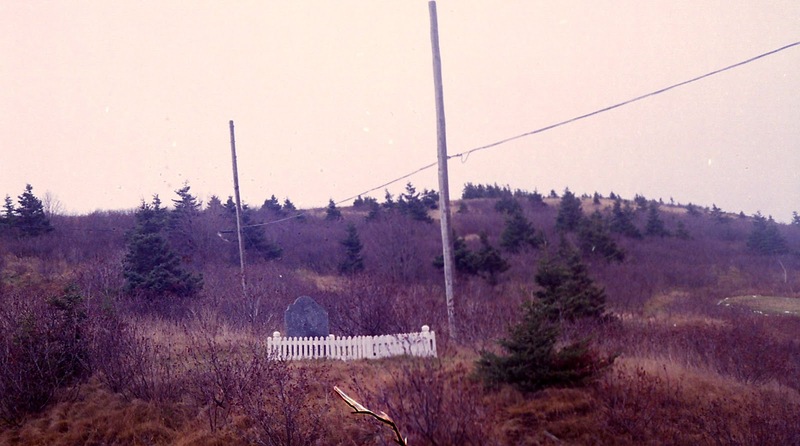 Despite its fairly small size, Bell Island has at least 12 different cemeteries. Some of these are considered new, while others are historic, dating back to the 18th and 19th centuries. The cemetery pictured here is by far the smallest--it has a single headstone, carefully fenced off, on the side of a hill. It can be seen from the road when you are driving onto the island from the ferry. One can't help but speculate as to why it is up there all alone. This single grave site surely has a story. Who is buried here? Why is this grave in this location? While I've heard a few stories about the person buried here, I'd be interested to hear your version. So, if you know anything about this little hillside graveyard, please email: lisa@heritagefoundation.ca. I look forward to hearing from you, and I'll be sure to write another post sharing people's answers to this query. This information was provided by Ed Kirby who has roots on Bell Island. This is an interesting account, and it also points towards a mystery around the actual burial site connected to this headstone (pictured above). "It’s that of Greg Normore, who supposedly was the first permanent resident of Bell Island, settling there around 1740. The headstone was moved to its current location in the late 1950s or early 1960s. I think it had previously been somewhere else on the hill, possibly in the old Anglican graveyard on the east hand side of the Beach Hill Road, or near the tram track to the west of the road. The tram, which was located between the road and the cemetery, moved people up and down the steep hill to the Beach ferry before Beach Hill Road was built. My mother’s family – both sides of it – were from Bell Island, and there was some skepticism that the site from where the headstone was moved was actually his burial site. The adults in the family said Normore’s actual burial site was unknown, and that the headstone was erected in an arbitrary spot overlooking the bay. The current site of the headstone is near the Catholic cemetery where the ground is about half rock and half clay, fit only for grazing and burying."